Last year the Fraser Valley Invasive Species Society in partnership with the City of Chilliwack and University of the Fraser Valley hosted Conrad Lindblom of Rocky Ridge Vegetation Management to conduct a demonstration on targeted grazing at a stormwater detention pond in Chilliwack. Targeted grazing is the controlled grazing of livestock – in this case, goats - to accomplish specific vegetation management goals – in this case, invasive plant management. Himalayan blackberry was chosen for this demonstration as it is one of the most widespread and economically and ecologically disruptive invasive plants in the Fraser Valley. It displaces native plant species, dominates riparian areas, has a significant economic impact on right-of-way maintenance, agriculture, park maintenance, and forest production, and physically inhibits access to recreational activities. It produces trailing canes with sharp spines that can grow approximately 7 meters per season. It reproduces from cane tips as well as by seed, collected by birds and other animals, allowing it to spread quickly across a landscape. At this City of Chilliwack stormwater detention pond, Himalayan blackberry is impeding access by city staff to inspect and maintain the culvert that prevents flooding from occurring on neighbouring farmland. Successful targeted grazing for invasive plant management must cause significant damage to the target plant while limiting damage to the surrounding vegetation. 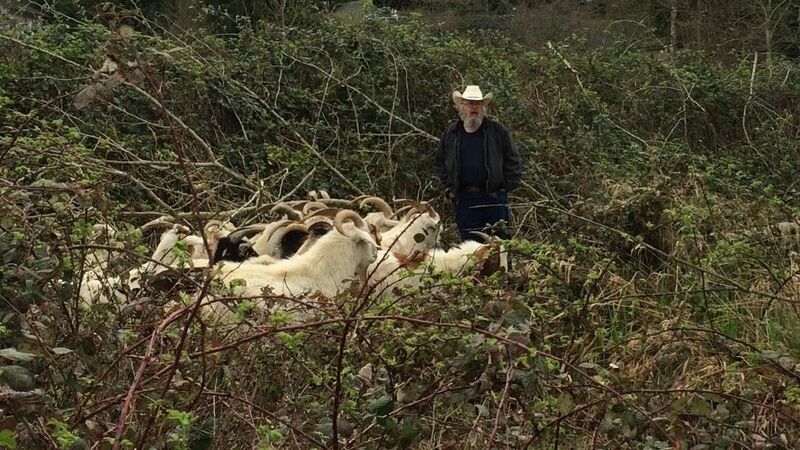 Conrad Lindblom of Rocky Ridge Vegetation Control uses dogs and horses to herd the goats, and in smaller areas, temporary fencing is erected to control more precisely where the animals are grazing. Timing is important - targeted grazing success is determined by how palatable the plant is to livestock, and when the target plants are most susceptible to damage. Most plants are most attractive and nutritious to livestock when they are young, and most vulnerable to grazing when they have started flowering. Fortunately goats will browse blackberries year-round, and consume the entire plant with the potential to destroy all top growth in one year of grazing. Goats are well equipped for eating shrubs with their dexterous tongues and lips and their ability to detoxify harmful substances that may be found in shrubs. If the grazing continues over multiple years, the plant's root reserves will become exhausted and the plant will be destroyed. It is important that a commitment is made to any control measures over the long term. The benefits of targeted grazing are numerous – it is less expensive than chemical or mechanical control, more environmentally friendly than chemical control, can be used in large tracts of land and in rough terrain, can be easily removed and moved around, and often improves biodiversity. It can be easily integrated with other control methods as part of an overall landscape vegetation management strategy. It should be noted, however, that it is not effective for all invasive plant species. Knotweed, for example, with its deep and persistent root system would not be successfully managed with targeted grazing. It is most effective on invasive plants that are successfully controlled by cutting/mowing.